Do I have your attention? Are you ready for a stack of delicious flapjacks? Healthy ones that taste just as good as the ones you used to drench in Aunt Jemima's syrup? I think you should prepare yourself to make these THIS Sunday. Sunday is the perfect day for pancakes. Growing up my Mom would always make fun shapes and animals with our pancakes. I know, so sweet right? She is the best. In any case, she would make bears a lot and on Valentine's day (or when I behaved well?) I would get hearts on my plate. So cute. I don't know how she did it and made it look so pretty? Getting the perfect pancake isn't easy- even when you are just trying to make a round circle. I guess with anything practice is a good place to start. This rule applies even more so when you are working with a new batter for the first time. The first one is almost always a flop. So don't get discouraged. My first couple of rounds using coconut flour (about a year ago) never quite ended up right, but now I know how to work with it as it can be tricky. Guess it was all that practice :) Not to worry. After you make a couple, you will get the hang of it and be whipping up another round of batter for a second batch. I say go for it! I'm current leading a cleanse here in Hong Kong and wanted to give the group something fun for the weekend. 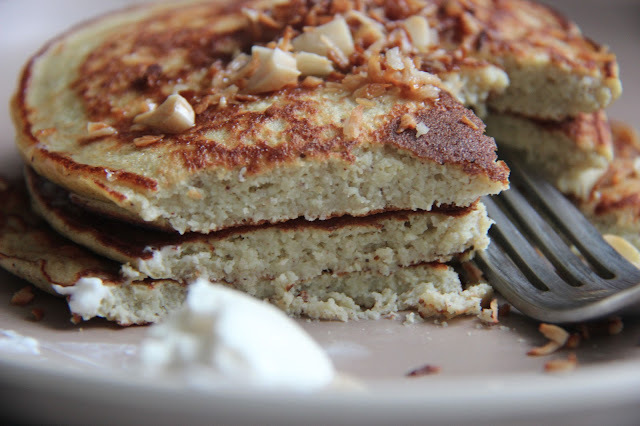 I think I hit the nail on the head with these coconut flour pancakes. I've tried several recipes from others and my own, which was sometimes successful and other times a disaster. The ingredients are minimal (mostly eggs). The results are delightful. And, the nutritional value beats any cafe's pancake out of the park. I wanted it to be really simple to make without too many ingredients to make it the right texture. After researching and experimenting, I found that these were just right. The key here for sweetness is banana. The eggs being the main ingredient with only a little coconut flour helps it all stay together. 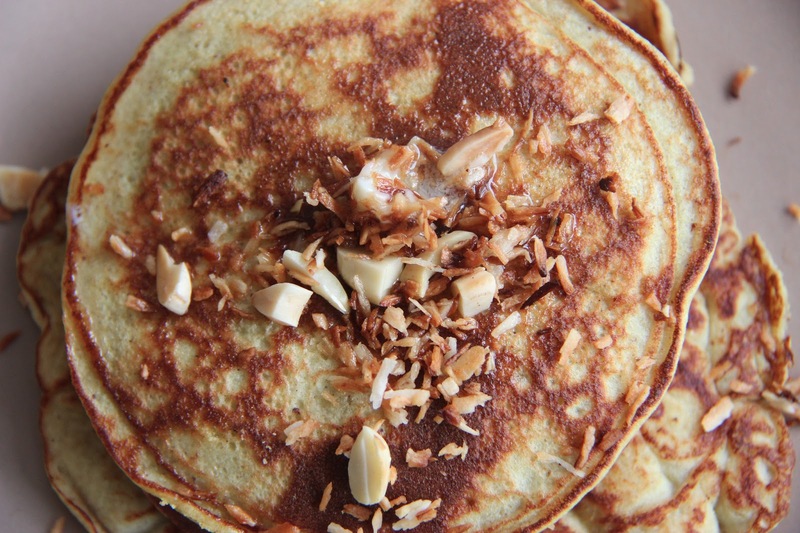 I only added a little melted butter and coconut oil with toasted coconut flakes and chopped almonds. No syrup needed. But if you want, grab some maple syrup and enjoy. A side of bacon would be divine. 1. Blend coconut flour, eggs, banana, cinnamon and salt in food processor until smooth. If it is too thick, you can add a little water, cream or almond milk to thin it. It should be creamy and slightly thick like a "real" pancake mix. 2. Preheat skillet to low-medium heat and add ghee or coconut oil to lightly coat pan. 3. Spoon circles on to the skillet (or try a bear if you dare!) and cook for 3-5 minutes, until the bubbles appear and they can be easily flipped. 4. Flip and cook another few minutes on the other side. *My pan is too small to make multiples at a time so I usually make one and eat while I cook! 5. Serve with a dab of grass-fed butter and drizzle of coconut oil. Toast coconut flakes and chopped almonds for extra YUM factor. *You might need to keep the heat lower and be patient with the flipping. Be sure to continue to keep the pan lightly oiled so that don't get to brown.